Every day on Wall Street, certain stocks trading for under $10 a share experience massive spikes higher. Traders savvy enough to follow the low-priced names and trade them with discipline and sod risk management are banking ridiculous coin on a regular basis. Just take a look at some of the large movers to the upside in the under-$10 complex from Wednesday, including Rex Energy (REXX , which exploded higher by 44.9%; Timmins Gold (TGD , which soared by 43.1%; Westport Innovations (WPRT - Get Report) ,which spiked sharply by 31.8%; and Ampliphi Biosciences (APHB , which jumped by 28.4%. You don't even have to catch the entire move in lower-priced stocks such as these to make outsized returns when trading. 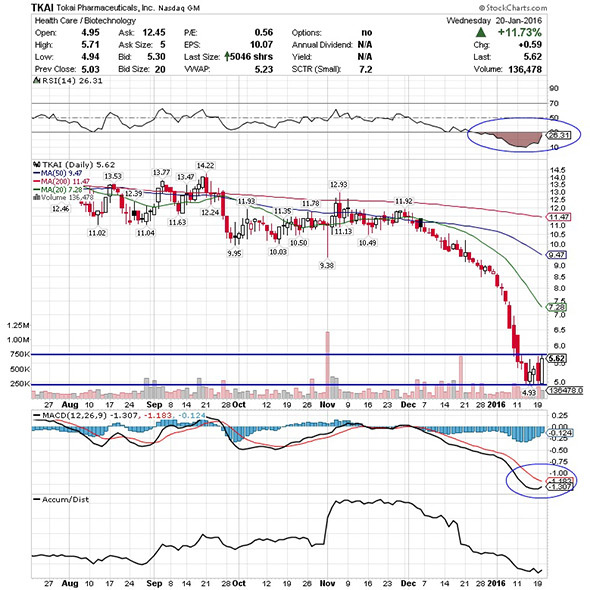 One under-$10 biopharmaceutical player that's starting to spike within range of triggering a big breakout trade is Tokai Pharmaceuticals (TKAI , which focuses on developing and commercializing therapies for prostate cancer and other hormonally driven diseases. This stock has been hit hard by the bears over the last six months, with shares off large by 58.9%. If you take a glance at the chart for Tokai Pharmaceuticals, you'll notice that this stock has been downtrending badly over the last two months and change, with shares falling sharply off its high of $12.93 to its new 52-week low of $4.93 a share. During that downtrend, this stock has been consistently making lower highs and lower lows, which is bearish technical price action. That said, shares of Tokai Pharmaceuticals have now started to rip higher off that $4.93 low and it's quickly moving within range of triggering a big breakout trade. Market players should now look for long-biased trades in shares of Tokai Pharmaceuticals if it manages to break above some key near-term overhead resistance at $5.75 a share with high volume. Look for a sustained move or close above that level with volume that hits near or above its three-month average action of 169,585 shares. If that breakout develops soon, then this stock will set up to re-test or possibly take out its next major overhead resistance levels at $7 to its 20-day moving average of $7.28, or even $8 a share. Traders can look to buy this stock off weakness to anticipate that breakout and simply use a stop that sits right below its new 52-week low of $4.93 a share. One can also buy shares of Tokai Pharmaceuticals off strength once it starts to move above $5.75 a share with volume and then simply use a stop that sits a comfortable percentage from your entry point. Another under-$10 biopharmaceutical player that's starting to trend within range of triggering a near-term breakout trade is Aegerion Pharmaceuticals (AEGR , which develops and commercializes therapies for patients with debilitating rare diseases in the U.S. This stock has been smashed lower by the sellers over the last six months, with shares plunging lower by 59%. 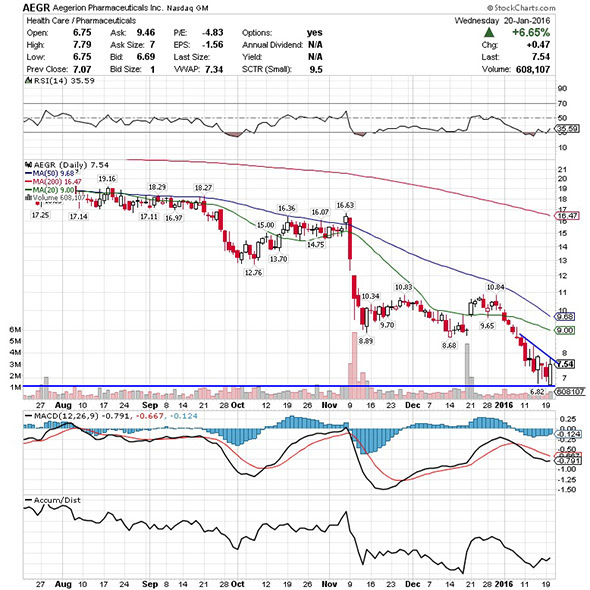 If you take a look at the chart for Aegerion Pharmaceuticals, you'll notice that this stock has been downtrending badly over the last two months and change, with shares collapsing off its high of $16.63 to its new 52-week low hit on Wednesday at $6.75 a share. During that downtrend, this stock has been making mostly lower highs and lower lows, which is bearish technical price action. That said, shares of Aegerion Pharmaceuticals ripped higher on Wednesday and displayed relative strength versus the overall market weakness. This strength is now quickly pushing the stock within range of triggering a near-term breakout trade above some key overhead resistance levels. Market players should now look for long-biased trades in Aegerion Pharmaceuticals if it manages to break out above Wednesday's intraday high of $7.79 a share and then above more near-term resistance at $8 a share with high volume. Look for a sustained move or close above those levels with volume that hits near or above its three-month average action of 823,052 shares. If that breakout fires off soon, then this stock will set up to re-test or possibly take out its next major overhead resistance levels at its 20-day moving average of $9 to its 50-day moving average of $9.68, or even $10 a share. Traders can look to buy this stock off weakness to anticipate that breakout and simply use a stop that sits right below its new 52-week low of $6.75 a share. One can also buy shares of Aegerion Pharmaceuticals off strength once it starts to take out those breakout levels with volume and then simply use a stop that sits a comfortable percentage from your entry point. One under-$10 biotechnology player that's starting to move within range of triggering a major breakout trade is Halozyme Therapeutics (HALO - Get Report) , which researches, develops and commercializes human enzymes. This stock has been destroyed by the sellers over the last six months, with shares off big by 60.2%. If you take a glance at the chart for Halozyme Therapeutics, you'll notice that this stock has been downtrending badly over the last month and change, with shares collapsing off its high of $17.78 a share to its new 52-week low of $8.27 a share hit on Wednesday. During that downtrend, this stock has been consistently making lower highs and lower lows, which is bearish technical price action. That said, shares of Halozyme Therapeutics displayed some relative strength on Wednesday versus the overall market weakness, after it ripped higher off that $8.27 low with strong upside volume flows. This high-volume trend to the upside is now quickly pushing this stock within range of triggering a major breakout trade above some key near-term overhead resistance levels. Traders should now look for long-biased trades in Halozyme Therapeutics if it manages to break out above Wednesday's intraday high of $10.07 a share and then once it clears more key resistance at $10.50 a share with high volume. 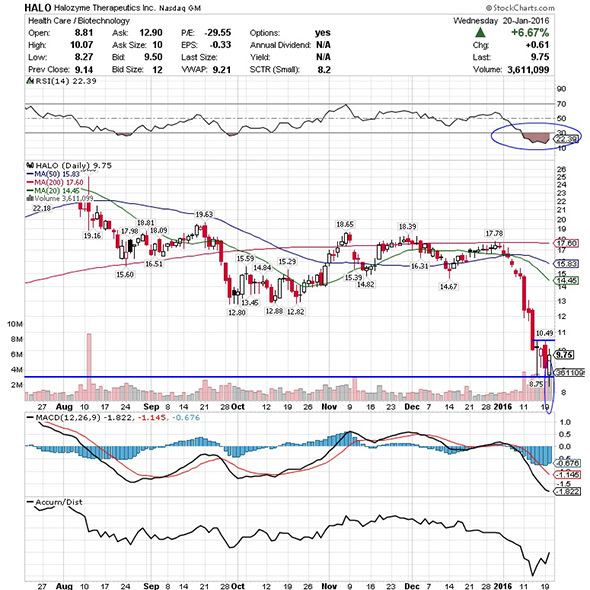 Look for a sustained move or close above those levels with volume that registers near or above its three-month average action of 1.36 million shares. 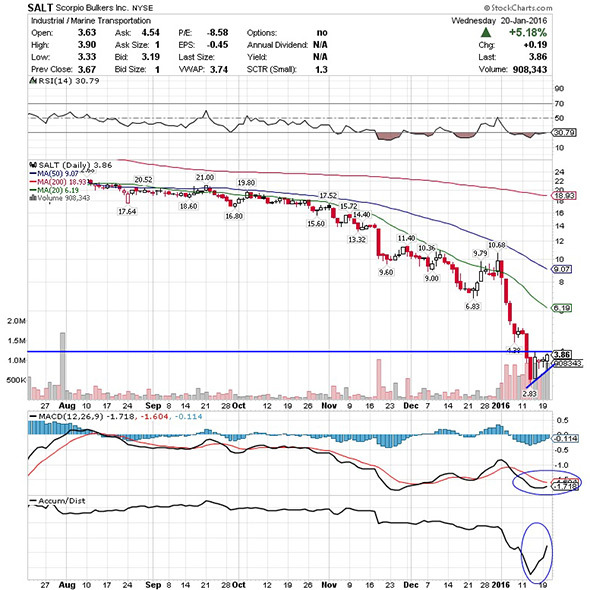 If that breakout takes hold soon, then this stock will set up to re-test or possibly take out its next major overhead resistance levels at around $12 to $13 a share. Traders can look to buy this stock off weakness to anticipate that breakout and simply use a stop that sits right below its new 52-week low of $8.27 a share. One can also buy shares of Halozyme Therapeutics off strength once it starts to move back above those breakout levels with volume and then simply use a stop that sits a comfortable percentage from your entry point. 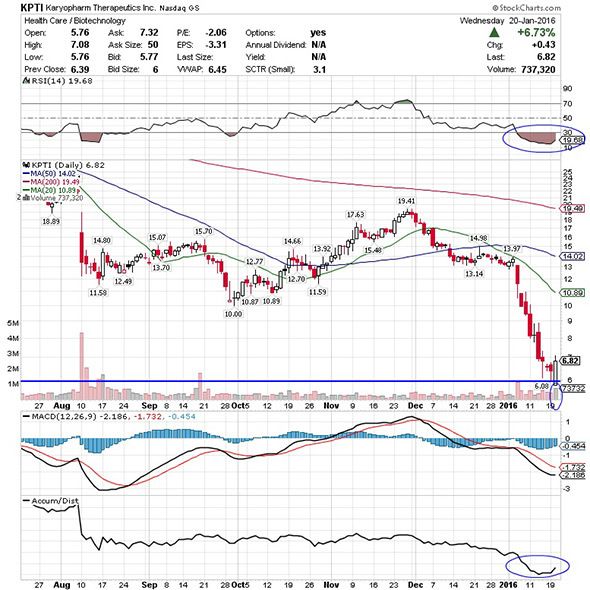 Another under-$10 clinical-stage pharmaceutical player that's starting to move within range of triggering a big breakout trade is Karyopharm Therapeutics (KPTI - Get Report) , which focuses on the discovery and development of drugs directed against nuclear transport targets for the treatment of cancer and other major diseases. This stock has been under massive selling pressure over the last six months, with shares plunging lower by 71.5%. If you look at the chart for Karyopharm Therapeutics, you'll notice that this stock has been downtrending badly over the last two months, with shares collapsing off its high of $19.41 to its new 52-week low of $5.76 a share tagged on Wednesday. During that massive downtrend, this stock has been consistently making lower highs and lower lows, which is bearish technical price action. That said, shares of Karyopharm Therapeutics spiked sharply higher on Wednesday off that $5.76 low with strong upside volume flows. This high-volume spike to the upside is now quickly pushing this stock within range of triggering a big breakout trade above some key near-term overhead resistance levels. Market players should now look for long-biased trades in Karyopharm Therapeutics if it manages to break out above Wednesday's intraday high of $7.08 a share and then once it takes out more key resistance at around $7.50 a share with high volume. Look for a sustained move or close above those levels with volume that registers near or above its three-month average action of 317,532 shares. If that breakout kicks off soon, then this stock will set up to re-test or possibly take out its next major overhead resistance levels at around $8 to $9, or even $10 a share. Traders can look to buy Karyopharm Therapeutics off weakness to anticipate that breakout and simply use a stop that sits right below its new 52-week low of $5.76 a share. One can also buy this stock off strength once it starts to bust above those breakout levels with volume and then simply use a stop that sits a comfortable percentage from your entry point. One final under-$10 shipping player that's starting to trend within range of triggering a major breakout trade is Scorpio Bulkers (SALT - Get Report) , which engages in the marine transportation of dry bulk commodities. This stock has been annihilated by the sellers over the last six months, with shares plunging lower by 81.9%. If you take a glance at the chart for Scorpio Bulkers, you'll notice that this stock has been downtrending badly over the last five months, with shares collapsing off its high of $21.54 to its new 52-week low of $2.83 a share. During that downtrend, this stock has been consistently making lower highs and lower lows, which is bearish technical price action. That said, shares of Scorpio Bulkers ripped sharply higher on Wednesday and displayed some relative strength versus the overall market weakness with strong upside volume flows. This high-volume jump to the upside is now quickly pushing this stock within range of triggering a major breakout trade above some key near-term overhead resistance levels. Traders should now look for long-biased trades in Scorpio Bulkers if it manages to take out Wednesday's intraday high of $3.90 a share and then above more key resistance at $4 a share with high volume. Look for a sustained move or close above those levels with volume that hits near or above its three-month average action of 277,106 shares. If that breakout materializes soon, then this stock will set up to re-test or possibly take out its next major overhead resistance levels at $5.07 to its 20-day moving average of $6.19 a share. Traders can look to buy shares of Scorpio Bulkers off weakness to anticipate that move and simply use a stop that sits right below Wednesday's intraday low of $3.33 a share. One can also buy this stock off strength once it starts to trend above those breakout levels with volume and then simply use a stop that sits a comfortable percentage from your entry point.